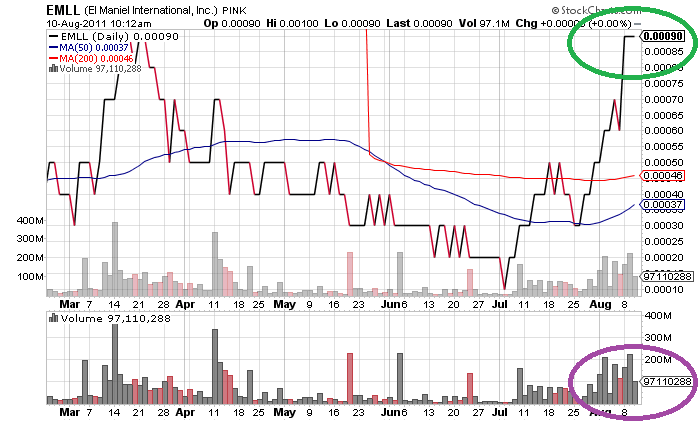 All of a sudden, El Maniel International Inc (PINK:EMLL) hit a massive gain. After a shocking loss on Monday, yesterday the stock soared 50% and traded over 161 million shares on the market. Following the chart, it seems that something has been pumping up EMLL stock price occasionally and there is only one explanation on the price jumps - positive news. Over the past weeks, El Maniel has been regularly releasing encouraging announcements on its business, which immediately reflected on the stock price. In fact, the latest news came up just yesterday, when EMLL reported its accelerated plans for preliminary operations in Papua New Guinea. According to the announcement, the company is expecting to initialize pilot operations in about 60 days or sooner, as well as projected revenues of $500.000 per month. The optimistic statements have certainly inspired investors. However, at this point the above-mentioned numbers remain only future projections. El Maniel International Inc. is a publicly traded company currently focused in the gold business domain. The company is not a reporting issuer under the Securities Exchange Act and, therefore, does not file periodic reports with the SEC. Still, its unaudited quarterly report is available online. According to it, as of June 30 this year the total assets of EMLL are higher than its liabilities, however, the company hasn't re-paid its long-term debt yet. Besides, it has incurred numerous expenses and a net loss that should be covered. Nevertheless, the quarterly report states that the actual results of El Maniel could differ from those estimates. Meanwhile, the only question left here is how long the good news may hold the progressive move.